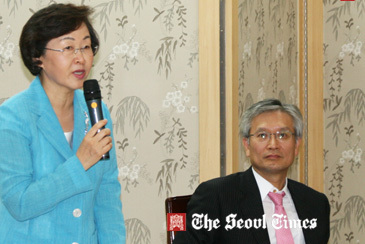 Gangnamgu Mayor Shin Yeon-Hee (left) speaks while President Lee Byung-Seok of Gangnamgu Medical Tourism Association looks on at ceremony held at Gangnamgu Office on July 24, 2012. 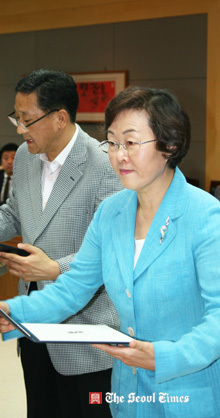 The Mayor of Gangnam City Shin Yeon-Hee signed an agreement for cooperation with Lee Byung-Seok, the president of Gangnamgu Medical Tourism Association in a ceremony for promoting medical tourism held at its office in the southern part of Seoul on July 24, 2012. During the ceremony Mayor Shin re-appointed medical institutions for cooperation in the medical tourism field and also conferred a plaque of appreciation on 16 medical institutions in Gangnam City for showing outstanding performance in attracting foreign medical tourists in the previous term. Earlier in the year Mayor Shin appointed 155 hospitals, clinics, hotels, department stores, and other institutions for cooperation in the medical tourism. They are 28 medical institutions, 21 hotels, two departments, COEX (convention and exhibition), and Korea International Trade Association (KITA). The new appointment is expected to promote the medical tourism within Gangnamgu, one of the 25 self administrative cities within the metropolitan Seoul. The recipients of the plaque of appreciation were 16 medical institutions including hospitals and specialty clinics. 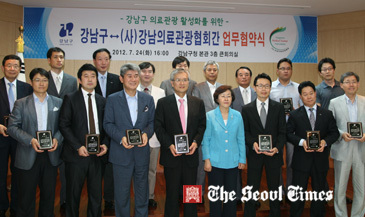 They were recognized by Mayor Shin for attracting over 500 foreign patients, respectively. As one of the most prestigious and prosperous district in Seoul, Gangnamgu has attracted the highest number of foreign patients among all the regional self-governing bodies. With a population of over half a million Gangnamgu City helped attract 24,535 foreign patients in the year 2011, a 28.2 percent increase over the previous year. The rich and posh area of Gangnamgu attracted the highest number of foreign patients among all the regional self governing bodies. The medical hospitals and clinics within Gangnam area recorded 45.3 billion won of revenue from the medical tourists, according to Gangnamgu Office. In the near future, the Gangnamgu Medical Tourism Association will work alongside with the counterparts of Vietnam and Indonesia to promote medical tourism in November 2012. Gangnamgu Mayor Shin Yeon-Hee (4th from right in front row) poses with participants at the medical tourism promotion ceremony held at Gannamgu Office in Seoul on July 24, 2012. In the meantime, some medical tourism-related events will be held in such nation's major cities as Incheon and Busan in the later months of 2012. In a brief speech Mayor Shin stressed the importance and advantages of Gangnamgu City over others in promoting nation's medical tourism. "Some 2,300 medical hospitals and clinics are concentrated in Gangnam," Mayor Shin said. "We also have great shopping centers and casinos within our district"
She also mentioned the millennium Buddhist temple "Bongeunsa" situated in the heart of Gangnam as one of the major tourist sites for the foreign visitors. 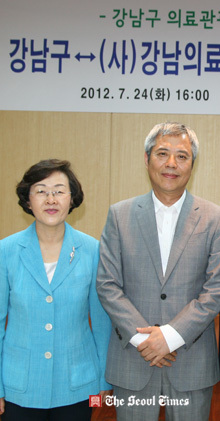 Gangnamgu Mayor Shin Yeon-Hee (left) poses with Chairman Lee Gang-Nam of Gwangdong Oriental Hospiral. The Gangnamgu Medical Tourism Association was established on June 1, 2012 and is chaired by General Director Lee Byung-Seok of Yonsei University's Gangnam Severance Hospital. Mayor Shin said that both Gangnamgu City and Gangnam Severance Hospital would further bolster cooperation by the new agreement in the medical tourism field. South Korea has been renowned worldwide for its success and advanced technology in the medical field in particular specializing in skin diseases, plastic surgery, cancer treatments and spine injuries. The Medical Tourism Association of Korea has actively involved various institutions in the promotion of medical tourism as can be seen from the rise of 57 institutions in 2009 to 474 institutions in 2012 involved in the initiative.